It was nicely decorated, good location, lovely bathroom, clean, plenty of hot water. Good heating. The stairs in the room were a bit treacherous, as they were slippery. Reception was helpful. Beautiful scenery, quiet and peaceful. The restaurant had a nice menu but somewhat limited for children. The food was a bit hit and miss. The fish and the artichokes were fantastic. All food beautifully presented. The paella, (and I'm from Valencia) was awful, more like a risotto and the rice was crunchy. Breakfast was of a good quality but there was not a huge selection. There is parking but it is limited. Where to find Gualchos hotels near an airport? Where can I find hotels in Gualchos that are near tourist attractions? 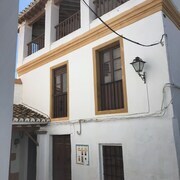 Although there is a limited range of accommodations in Gualchos itself, Expedia's database lists a wide range of alternatives in the wider area. There are as many as 31 hotels within 0.1 kilometres (0.06 miles) of Gualchos. The nearest Expedia hotel is the Playacalida Spa Hotel Luxury, Granada, which is 25 kilometres (15 miles) from the middle of Gualchos. 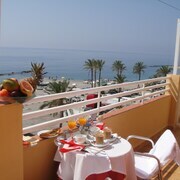 Also, try the Elba Motril Beach & Business Resort, located in Granada, which is 13 kilometres (8 miles) away. 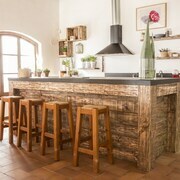 20 kilometres (14 miles) from the heart of Gualchos, is the Hotel de Mecina Fondales. 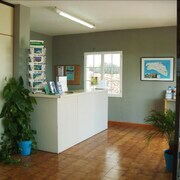 The Hotel Apartamentos Alquería de Morayma is located 30 kilometres (17 miles) away. 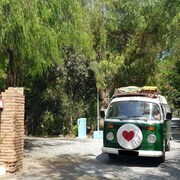 Two more Expedia-listed accommodations are the Finca Los Llanos and the La Oveja Verde Apartamentos. After you have learned about Gualchos, why don't you go a bit more of the area? The Andalucia region has a number of attractions. Andalucia is marked by beaches and coastal plains. Commonly visited Andalucia tourist sites include ruins. Popular activities in this particular part of Spain include snowboarding. 25 kilometres (16 miles) away from Gualchos you will find Pampaneira, where you can explore Abuela Ili and O Sel Ling. 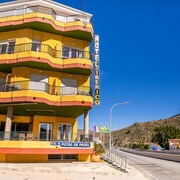 Some of our recommended Pampaneira accommodation options are the Hotel Villa de Bubión and Hotel Poqueira II. 90 kilometres (57 miles) to the west of Gualchos, you'll find Centro, which is home to the Parador Malaga Gibralfaro and Vincci Seleccion Posada del Patio. If you stay in Centro, set aside some time to check out the Museo de la Semana Santa and Museum House of Dolls. Get your sports fix by making a journey to Plaza de Toros, which is 55 kilometres (33 miles) to the north of Gualchos. Sports fans wanting to find a room or apartment near to the action can take their choice from the Parador De Granada or the Hospes Palacio de Los Patos. Check out our current Gualchos travel listings and learn about the great visitor attractions that this part of the world has in store. 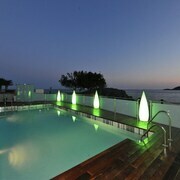 What are the most popular Gualchos hotels? Are there hotels in other cities near Gualchos? What other types of accommodations are available in Gualchos? Explore Gualchos with Expedia.ca’s Travel Guides to find the best flights, cars, holiday packages and more!